220-222-224 Marlborough is located on the SW corner of Marlborough and Exeter, with 16 Exeter (196 Marlborough) to the east, across Exeter, 226 Marlborough to the west, 11 Exeter to the north, across Marlborough, and 17 Exeter to the south, across Alley 426. 220 Marlborough and 222-224 Marlborough were designed by architect Frederick B. Pope and built in 1892-1893 for real estate dealer Albert Geiger. 220 Marlborough was built as a six-unit apartment building, and 222-224 Marlborough was built as a twelve-unit building. Albert Geiger is shown as the owner of both 220 and 222-224 Marlborough on the original building permit applications, dated April 13, 1892. 220 Marlborough was built on a 28 foot wide lot and 224-224 Marlborough was built on a 56 foot wide lot. 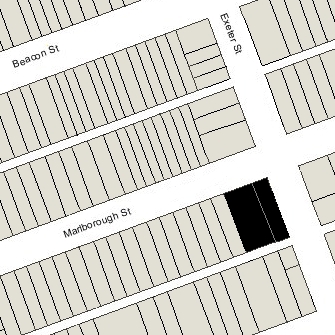 The 84 foot wide parcel was composed of a vacant lot at the corner 83 feet six inches wide and a six inch strip to the west with the eastern half of the party wall at 226 Marlborough on it. Albert Geiger purchased the 83.5 foot lot on February 26, 1892, from Samuel C. Lawrence, who had purchased it on March 30, 1886, from George B. Upton. It had originally been purchased from the Commonwealth of Massachusetts on January 12, 1886, by Henry Lee as two lots, a 32 foot wide lot at the corner and a 51 foot six inch wide lot to the west. Albert Geiger purchased the six inch strip to the west on March 26, 1886, from Dr. Clarence Blake, who had built his home at 226 Marlborough in 1882. Click here for an index to the deeds for 220-222-224 Marlborough. Albert Geiger and his wife, Emma (Pfyffer) Geiger, lived in an apartment at 290 Commonwealth and then at The Chesterfield at 371 Commonwealth, which he built at about the same time as 220 Marlborough and 222-224 Marlborough. On November 17, 1892, probably while they were still under construction, 220 Marlborough and 222-224 Marlborough were purchased from Albert Geiger by iron and steel merchant Barthold Schlesinger. He and his wife, Mary (McBurney) Schlesinger, lived in Brookline. 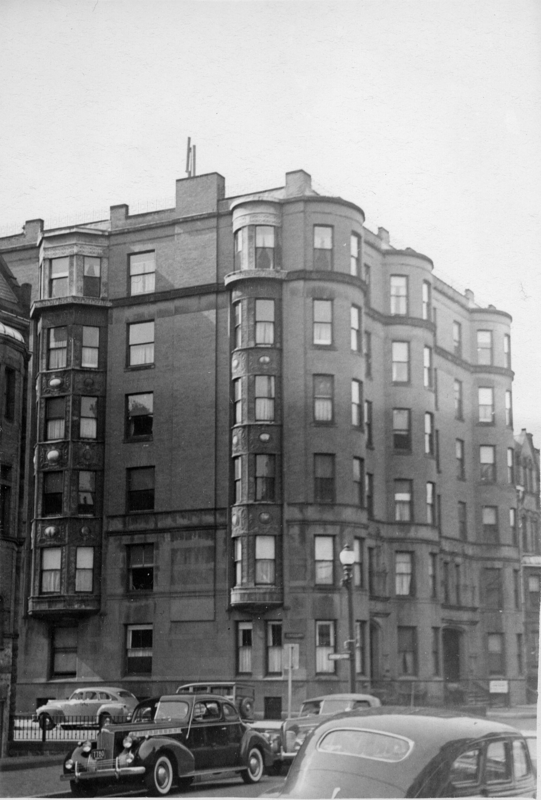 Albert Geiger and Barthold Schlesinger were associated in several apartment building projects in the Back Bay. Albert Geiger had purchased 293-295 Commonwealth in November of 1890 and 290 Commonwealth (where he and his wife subsequently lived) in January of 1891. All three buildings were under construction when he acquired them and, after they were completed, he sold them to Barthold Schlesinger: 290 Commonwealth in March of 1891 and 293-295 Commonwealth in May of 1891. In January of 1894, Albert Geiger acquired all three buildings back from Barthold Schlesinger and resold them to new owners. Berthold Schesinger retained 220-222-224 Marlborough and continued to own them at the time of his death in July of 1900. The properties subsequently were held by a trust established in his will for the benefit of his wife and their children. On February 24, 1911, 220 Marlborough was damaged by a fire that started in a rubbish basket on the first floor landing of the rear stairway and burned through the roof. Smith Burton and his wife, Lilla Louise (Davis) Atwood Burton, lived in Newton. On February 28, 1940, 220-222-224 Marlborough were purchased from Smith Burton, Jr., by the Berkeley Realty Corporation. It purchased 17-19 Exeter on the same day. On April 26, 1940, it transferred the properties to real estate dealer Walter H. Scott. On July 16, 1941, the Home Savings Bank foreclosed on the mortgage given by Smith Burton, Jr., and assumed by subsequent buyers and took possession of 220-222-224 Marlborough. On April 29, 1943, 220-222-224 Marlborough were acquired from the Home Savings Bank by real estate dealer Howard S. Cosgrove. The property changed hands and on January 2, 1947, was acquired by Louis Heller. He and his wife, Elizabeth (Kayhart) Dare Pendleton Heller, llved in Brookline. He was a real estate dealer and had been the treasurer of the Berkeley Realty Corporation when it owned 220-222-224 Marlborough in 1940. Elizabeth Heller was a former actress. In November of 1948, they purchased and subsequently moved to 312 Dartmouth. On March 10, 1949, Louis Heller transferred 220-222-224 Marlborough into his and his wife’s names, and on December 12, 1955, they transferred the property into her name. On December 1, 1971, 220-222-224 Marlborough were purchased from Elizabeth Heller by Robert A. Kuras, Richard A. Means, Robert L. Horowitz, Richard N. Nemrow, and Francis C. Pratt, trustees of the 220 Marlborough Associates Trust. 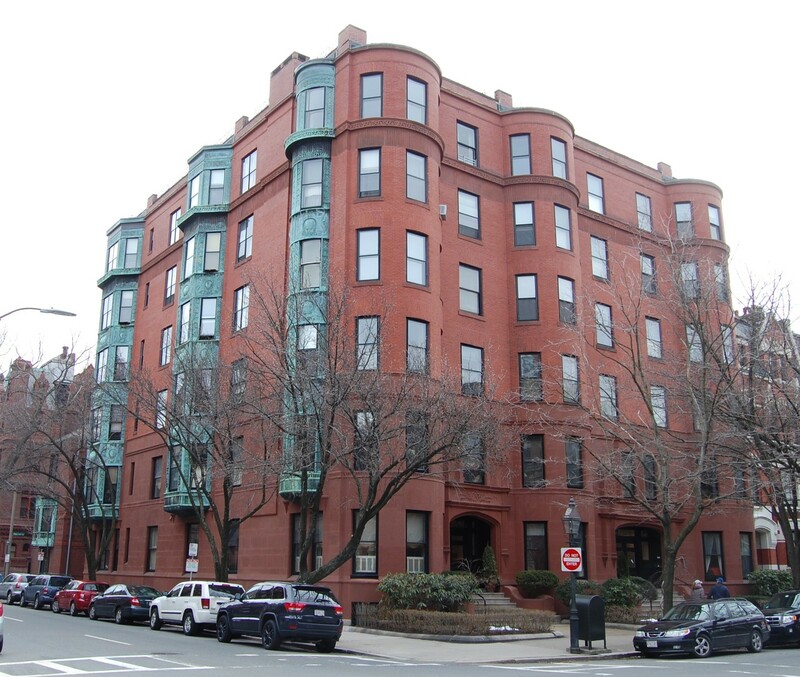 On September 14, 1972, they converted the property into eighteen condominium units, the 220-222-224 Marlborough Street Condominium, with six units in each building.